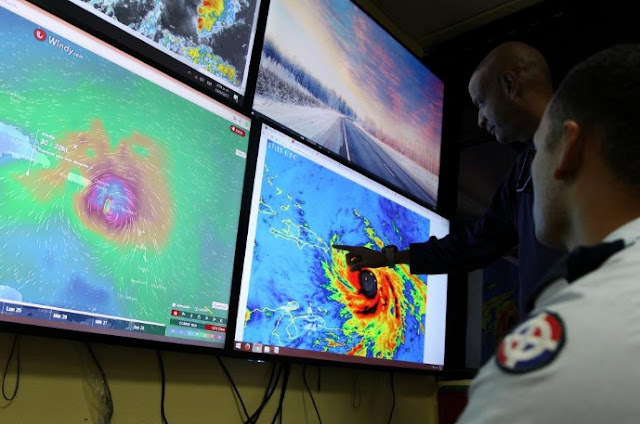 Members of the Emergency Operations Committee (COE) monitor the trajectory of Hurricane Maria in Santo Domingo, Dominican Republic, September 19, 2017. SAN JUAN, Puerto Rico - Hurricane Maria, the second maximum-strength storm to hit the Caribbean this month, battered the U.S. Virgin Island of St. Croix on Wednesday and was headed to Puerto Rico with catastrophic winds and dangerous storm surges. It killed at least one person in Guadeloupe and devastated the tiny island nation of Dominica. The storm came just days after the region was punched by Hurricane Irma, which ranked as one of the most powerful Atlantic storms on record and left a trail of destruction on several Caribbean islands. Maria, a rare Category 5 storm at the top end of the five-step Saffir-Simpson scale, was packing maximum sustained winds near 165 mph (270 kph) with higher gusts, the U.S. National Hurricane Center (NHC). It was about 20 miles (32 kms) southwest of St. Croix as of 1 a.m. EDT (0500 GMT) on Wednesday morning and its outer eyewall was lashing the island with sustained winds of about 90 mph (145 kph), the NHC said. Maria was predicted to be the worst storm to hit St. Croix, home to about half of the U.S. Virgin Island’s 103,000 residents, since Hugo, a Category 4 storm, in 1989. Many U.S. Virgin Islands residents fled to shelters around midday Tuesday. U.S. Virgin Islands Governor Kenneth Mapp warned people on the islands that their lives were at risk. Hector Cintron, who works at a telephone company on St. Thomas, said he had spent the past couple of days preparing generators, securing his belongings and clearing debris as he and his neighbors prepared for a repeat of Irma. “There’s a lot of stress and a lot of anxiety. It’s off the charts,” he said. Maria will cross Puerto Rico on Wednesday and pass just north of the northeast coast of the Dominican Republic on Wednesday night and Thursday, the NHC said. It was too early to know if Maria will threaten the continental United States as it moves northward in the Atlantic. Earlier this month, Irma devastated several small islands, including Barbuda and the U.S. Virgin Islands of St. Thomas and St. John, and caused heavy damage in Cuba and Florida, killing at least 84 people in the Caribbean and the U.S. mainland. Maria was set to be the strongest hurricane to hit Puerto Rico in nearly 90 years, likely a Category 4 or 5 when it makes landfall, the NHC said. A slow weakening is expected after the hurricane emerges over the Atlantic north of Puerto Rico and the Dominican Republic, it added. In Puerto Rico, Maria is expected to dump as much as 25 inches (63.5 cm) of rain on parts of the island and bring storm surges, when hurricanes push ocean water dangerously over normal levels, of up to 9 feet (2.74 m), the NHC said. The heavy rainfall could cause life-threatening flash floods and mudslides, it added. “We have not experienced an event of this magnitude in our modern history,” Ricardo Rossello, governor of Puerto Rico said in a televised message on Tuesday. “Although it looks like a direct hit with major damage to Puerto Rico is inevitable, I ask for America’s prayers,” he said, adding the government has set up 500 shelters. Puerto Rico, a U.S. territory of about 3.4 million people, avoided a direct hit from Irma, but the storm knocked out power for 70 percent of the island, and killed at least three people. Maria promises to be worse. About 150 flights were canceled at the main international airport in Puerto Rico on Wednesday morning, according to tracking service FlightAware.com. U.S. airlines said on Tuesday they would cap one-way fares at $99 to $384 to aid evacuations. The storm plowed into Dominica, a mountainous country of 72,000 people, late on Monday causing what Prime Minister Roosevelt Skerrit called “mind-boggling” destruction. “The winds have swept away the roofs of almost every person I have spoken to or otherwise made contact with,” Skerrit said on Facebook, noting that his own residence had been hit, too. He said he was now focused on rescuing people who might be trapped and getting medical help for the injured. North of Dominica, the French island territory of Guadeloupe appeared to have been hit hard. The Guadeloupe prefecture said one person was killed by a falling tree and at least two people were missing in a shipwreck. Some roofs had been ripped off, roads were blocked by fallen trees, 80,000 households were without power and there was flooding in some southern coastal areas, the prefecture said in Twitter posts. Video footage released by the prefecture showed tree-bending winds whipping ferociously through deserted streets and shaking lamp posts when the storm first hit. Hurricane Maria, the second maximum-strength storm to hit the Caribbean this month, battered the U.S. Virgin Island of St. Croix on Wednesday and was headed to Puerto Rico with catastrophic winds and dangerous storm surges.